Hotfile is a popular file hosting service that allow users to make money online by just uploading free and non-copyrighted files. The income from Hotfile depends upon the affiliate rank of an account and the total number of downloads made from it. Affiliate rank is automatically generated in each day after analyzing certain parameters. These parameters include the ratio of the number of upload to number of downloads and users converted into premium account holders. What makes Hotfile different from other “paid to share” services is the transparency in payments. Hotfile uploaders program is open for all. But if you are a blogger you could make more money from the service buy changing your software and other download links to Hotfile links. It would become useful as a passive income source that doesn’t need any extra promotion. Create your free account here. After creating an account, click on the upload link on Hotfile.com. They will give you a direct link after completing the upload process. Promote that link through your blogs or through forums. Make sure that you share legal stuff to avoid ban from the system. All downloads made from your account will be paid based on the table given above. Users from the certain countries would convince more into buying a premium account, so their downloads will be paid well. Uploading large files would also convert into premium accounts. All these factors will be taken to determine affiliate rank. The following screenshot shows the income generated from an account with Platinum Rank. 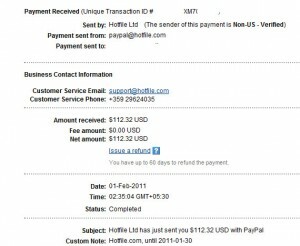 Hotfile pays their affiliates each week through Paypal. 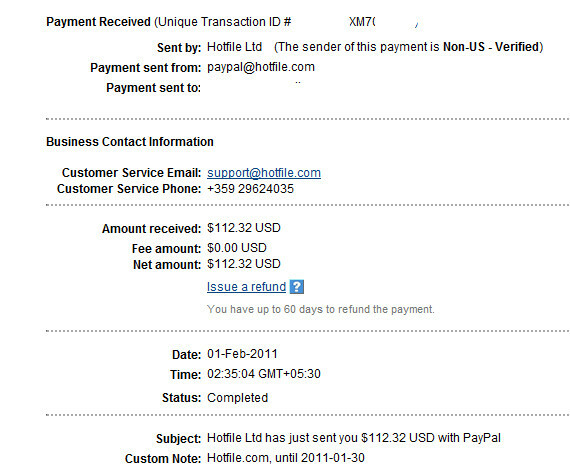 The following screenshot shows the payment proof. You may also use the amount in your Hotfile uploaders account to buy premium accounts. Just go to the “My Statics” page to do this. Update: Hotfile is getting sued by MPPA and others for copy-right violations. Use the service only if you are planning to host your own files or free stuff. But isn’t hotfile getting SUED by major film companies for copyright? Correct Nathan, they are getting sued by MPPA and others. I just only shared the Hotfile revenue model. You could end up in trouble for hosting copy-righted files. That’s why I mentioned in the post that you should use free files.